Janice Horton - author of romantic adventure novels: The End... well almost! I’m excited to tell you that just a few days ago, after finally settling down somewhere long enough to get some work done, I have at long last finished writing my next romantic adventure novel entitled ‘Island in the Sun’. I’ve now sent it off to my lovely editor for its first round of edits. If you are not familiar with the publishing process and are wondering what this means exactly, my editor will read through the manuscript at this stage and then get back to me with a full assessment on whether, in her opinion, the story works, if the plot hangs together, and if the characters feel three dimensional and real to her. She might suggest I rewrite particular scenes and she will look out for plot holes and gaffs and bloopers and the over-use of particular words and for continuity in the storyline. Then, I’ll either take on board what she has said, or not. I’m not obliged to accept her suggestions, but as she has been my editor for many years, I usually find she is absolutely spot on in her observations! After I’ve read her assessment several times and mulled over her suggestions for improvement, I will work on the novel again. The final stage of editing is when the the manuscript is checked over line by line to look out for errors and to correct layout and grammar and spelling. My editor is very good at what she does and, once she has worked her magic, the manuscript will come winging its way back to me looking and reading like a proper novel. Then and only then is it ready to be seen by you – the reader! While I’m waiting for the assessment edit I’ll be keeping very busy indeed writing ‘the synopsis’ and ‘the blurb’ for Island In The Sun, which I know I will find very difficult to do. The synopsis is used as a marketing tool to explain what happens in the book using just one or two pages of writing, while the blurb is the essence of the book in just one or two paragraphs, and is often seen on the back cover of the physical book and used as the book description for Amazon etc. So the words have to be chosen carefully! I also have a travel feature to write for LLm (Loveahappyending Lifestyle Magazine) as part of my regular ‘Janice Horton’s – Dream, Explore, Discover… Travel’ which will be published on 11th December 2016. This time, I will be writing about Kuala Lumpur, (known otherwise as KL and the gateway to South East Asia). KL is a city that I’m now fortunate to know very well indeed, having been there several times throughout 2016. I also intend to catch up to date with my lack of blog posts here regarding my travel itinerary. My last travel post was about our amazing trip to Vancouver Canada (which you can read about HERE). 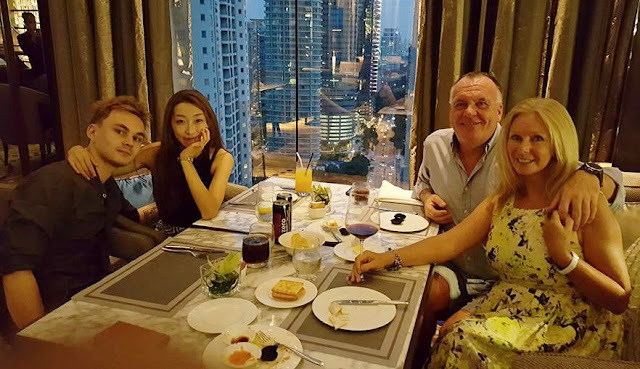 So, my next blog post, will be about how we flew away from Canada (via Houston Texas and Tokyo Japan) to arrive (after twenty five hours in the air) at Kuala Lumpur, where we met up with our middle son James and his lovely wife Sujeong. James and Sujeong and our grandson Aaron live in South Korea. We were meeting up with them in KL to help them celebrate their second wedding anniversary. Although, our beautiful grandson wasn’t with them on this occasion, as this was a grown up affair and what a wonderful and fun few days we had, sightseeing and shopping and eating and drinking – and so I warn you now that there will be lots of photos in my next post! Helping James and Sujeong to celebrate their wedding anniversary in style.